Tazwell Chapter is incorporating the ABATE State Rally and their annual Motorcycle Awareness Rally for three days of fun in beautiful Tazwell at the Moose Lodge Campground. The Comfort Inn of Bluefield is a 15 minute ride from the campground and has 30 reserved at $90.00 per night. Call 276-326-3688 and ask for the group rate. Prof is hoping to ride the Back of the Dragon on Friday. Any other takers? ABATE of Virginia now has pre-sale State Rally tickets on sale. 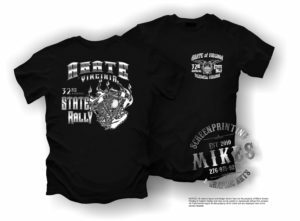 Buy your pre-sale ticket now from any ABATE Chapter in the state and you can receive a discount on the Rally T-Shirts for only $10. There will be a cut off date of June 21st on the pre-sale tickets, after that the Rally T-Shirts will cost $15 at the event August 3rd thru the 5th. You can get your shirts in tank tops or short sleeves.